What effect does average have on a batsman? Having been asked many times what made Don Bradman so much better than the rest, I came to the conclusion it was his unique ability to replicate the more relaxed thought process of a net session while batting in the middle. I reached this point of view after watching footage of Bradman bat to save the 1938 Trent Bridge Test. On that occasion, his footwork, normally positive and precise, looked like any other batsman's, as he shuffled in the crease, defending doggedly to stave off defeat. This drastic change in mindset was brought on because he was desperate to save a match in which Stan McCabe had played a memorable innings. As McCabe flayed the English attack, Bradman had famously said to the Australian players in the dressing room: "Come and look at this, you'll never see its like again." Despite McCabe's brilliance, Australia was forced to follow on, and for once Bradman must have felt the external pressures that he was obviously able to eradicate from most of his other innings. Maybe he also experienced that same feeling in his final Test innings when he made a duck, needing only four runs for a career average of a hundred. And that prompts the question: "What effect does batting average have on players?" While he smote the English attack in scoring a record-breaking 156 off just 63 balls in the T20, Aaron Finch didn't seem to have a care in the world. Contrast that onslaught with his miserable last two Sheffield Shield seasons, where he has accumulated a minuscule 300 runs in 19 innings at the pedestrian strike rate of 58 runs per hundred balls. In T20, your strike rate is the dominant statistic and the batting average takes a back seat. Most players are not so bothered about sacrificing their wicket in the format, because "that's the nature of the game". However, in Test and first-class cricket very few players are willing to embrace equally the disparate ambitions of personal success and entertaining the crowd. After such a brutal display of hitting, it's natural to wonder: why can't Finch do better in longer forms of the game? Finch is acknowledging that average counts by playing differently at first-class level to try to maintain a place in the side. Average is one of the measures selectors use to judge a batsman. 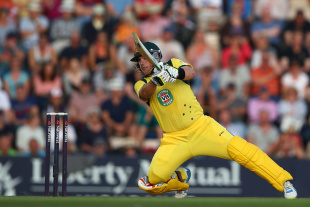 One commentator described Finch's T20 knock as a great innings. While there's no doubting the entertainment value, I would argue the lack of a contest - the bowlers appeared powerless to stop Finch - made it more of an exhibition of exceptional hitting. Part of the enjoyment of a memorable innings is to witness a batsman overcome everything the bowlers produce in the contest. Consequently, the great Test knocks are readily remembered many years later. Bradman's 300 in a day at Headingley and McCabe's brilliance at Trent Bridge are still regarded as classic innings despite being played early last century. Brian Lara's record-breaking 400 and VVS Laxman's exquisite 281 at Eden Gardens were compiled years ago but are still recalled fondly. Even some of the shorter-form knocks such as Sachin Tendulkar's epic 200 to become the first player to reach that level in an ODI will be talked about for years. Chris Gayle's blazing century in the inaugural World Twenty20 is still recalled as the first of its kind. And Garry Sobers' feat in achieving six sixes in a first-class over is still talked about in awe. Players like Sobers, Tendulkar and Gayle have a huge advantage over Finch in a cricket fan's memory. Those three will long be revered as all-round batsmen because of their highly successful Test careers. Finch, on the other hand, unless he can find a way to play the longer form successfully, is in danger of being remembered simply as a bowler bully whose brutish hitting was discounted by shortened boundaries, enlarged bats and flat pitches. In order to elevate his status as a batsman, perhaps Finch needs to take a leaf out of Bradman's book. He could try emulating the thought process in first-class cricket, not so much of his net sessions but of the T20 arena.